I want to start my review by saying how grateful I am to the team at TheNovl. I’ve been a part of the Book Squad for quite a few months now and every single book I’ve reviewed has been amazing. I don’t know how they do it, but they always find the best stories and incredible authors and I’m just so happy to be a small part of that as a reader! That said, I did receive this book from TheNovl in exchange for an honest review. 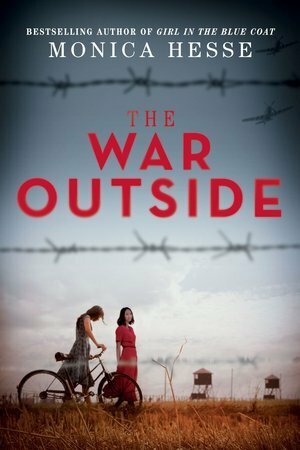 The War Outside is about two girls and their families that are sent to Crystal City, an internment camp in Texas, USA, during WWII. Margot has German parents and Haruko Japanese, but both are second generation, so the US is the only country they’ve ever called home. We follow them as they try to reconcile their new “normal” locked inside a fence and the friendship (maybe more?) that blossoms between them. I had to sit on this review for a while. Actually, when I turned the final page of the book I just had to give myself a few minutes. It’s so heartbreaking and emotional. The story is told in alternating narrative between the two girls. Sometimes we even see the same scene from their different view points. The author really does this so well. There are just so many underlying feelings and pain woven throughout this story and I got really attached to the characters. I would love more of their stories. What happened to them after the end of the book? The author’s note at the end of the book is great too. She explains the elements of the story that are historically accurate and where some of her ideas in the book came from. WWII was such an interesting time in our world’s history and there are so many terrible things happening that I think it’s important to reflect on and not allow to happen again. Many of the messages throughout this book are incredibly relevant to our current political climate. Absolutely give this book a read if you’re at all interested in historical fiction! And now, a new segment to my reviews because I always mark passages that I love, but I also always forget to share them. Thank you! It’s definitely worth it. I don’t think it necessarily reads as a traditional YA because of all the heavy things the characters are dealing with.